From the geographical point of view, Montevideo Port is the main gateway to MERCOSUR, composed by Argentina, Brazil, Paraguay, and Uruguay. Situated on Río de la Plata, at an equal distance from the main consumer markets of the region, Montevideo Port is the central influence axis for more than 300 million inhabitants of the Southern Common Market. It is formed by a natural bay that ensures easy access of vessels, both fluvial and maritime, having an average depth of 30 feet (9 meters). Furthermore, it should be added that it is operative 24 hours a day, 365 days a year, which ensures an agile, efficient and low-cost rendering of services. 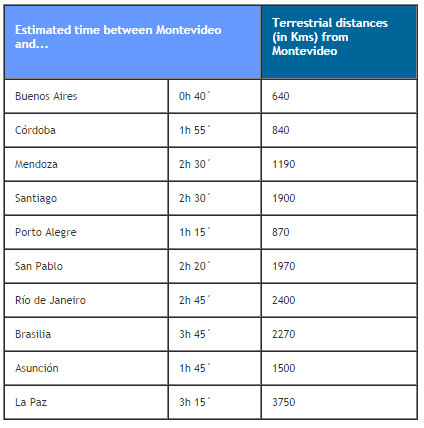 Due to its geographical location, Montevideo Port is connected to the main highways, airlines, railway lines, maritime and river routes of the region. It is located in the Paraguay-Paraná-Río de la Plata Watergate, constituting the main hub of the region serving international clients. This allows a higher speed for the transport of incoming or out-going goods from the harbour, towards or from different countries of the region. POLO LOGÍSTICO PORTUARIO also has access to the Uruguayan and regional railway system. A natural harbor under the scheme only free port in the region.